Whoa, Walmart.com. Why Do You Have a Section Called ‘Fat Girl Costumes’? Either someone at Walmart has made a terrible mistake, or else the retailer's SEO trolling is top notch. 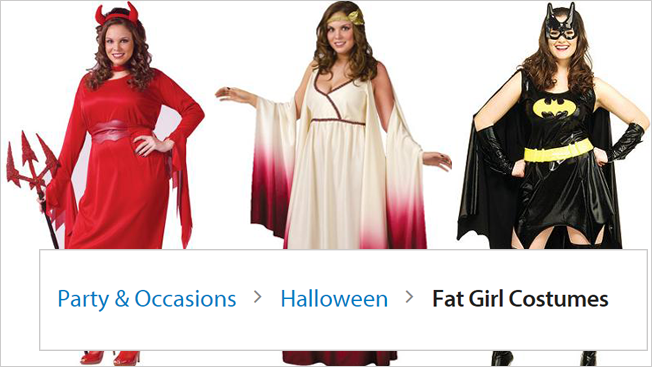 There are several other "related' categories like "Plus Size Halloween Costumes" and "Adult Plus Halloween," which makes me wonder if these groupings are automatically generated from some of the descriptive metadata supplied by low-budget vendors. If so, it might be time for Walmart to step up the curation on its site's organization. And if this wasn't some weird third-party metadata issue, Walmart needs to step up its goddamn common sense. UPDATE 2: Around 11:15 a.m. ET today, Walmart removed all items from the category. The page now shows the message, "We found 0 items for the Fat Girl Costumes page."